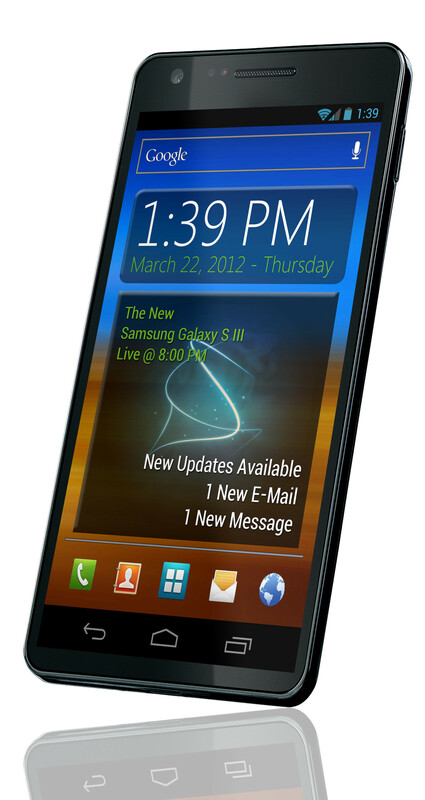 Yes, ladies and gents, the Samsung Galaxy S III, in its very final form could look like this. A tipster sent us what looks like a press photo of the allegedly “final design” of the Galaxy S III. It may be it or it may not be it and here is why. First, the Galaxy S III in the form we see on the right is a device with no physical buttons. That would be a departure from Samsung’s typical rectangular physical home key on both the original Galaxy S and its sequel, but it is possible given that Android Ice Cream Sandwich doesn’t require the physical keys. Also, what’s said to be the Galaxy S III here shows a display extending to almost the whole length of the front panel, which could be seen as an indicator that it’s bigger, but of course it’s no hard proof. Now, what’s interesting is that the phone’s display shows March 22nd - supposedly the announcement date. Here’s where it starts smelling fishy - suddenly the font is too big, and the notifications panel below is also too vague, as if it was all quickly put together in Photoshop. This tips the scales for us - the render probably fake, but we leave it up to you to weigh in on the image. It's clear, though, that we all want the Samsung Galaxy S III to come sooner rather than later. Just yesterday, tech insider Eldar Murtazin dropped the rumor bomb by saying Samsung has finalized the product design and is bringing the SGS III with a ceramic finish. It’s also obvious that Samsung wants to be better prepared for the launch this time. Last year, it launched the SGS II in April internationally, but stateside the handset arrived with a huge delay. Carriers only started getting it in mid-September, so there was not much time it was on sale and it’s still selling great. A look at the calendar of major events for 2012 reminds us that Samsung is one of the big sponsors for the Summer Olympics kicking off in late July. If we were to build our own conspiracy theory about the next Galaxy S, that would be an ideal coincidence for the launch, don’t you agree? Do you have other suggestions and how do you imagine the SGS III? Could this be it? Let us know in the comments below. Galaxy S II, with software buttons!! its obvious fake ! you shouldn't post every sh!t you find! I thought the same... (the last sentence) What a way to do NEWS! I think they should not post ANY s**t they find. Hopefully I hope this what the next Epic 4g touch will look like w/LTE of course.I mean Sprint already announced the arrival of the Galaxy Nexus but I'll wait for this instead. Yes I have and no, not awesome. Sorry you do not like my personal opinion. Faster CPU + LTE + super thin + Samsung = battery will be dead before the camera app can even start up. Hm, I guess we should take apart some things here and analyze what you just said: 1. Faster CPU: Yes, it will be faster but also will be manufactured on a 32 nm or less node. Secondly, the Exynos that is rumored to come on the GSIII (or whatever name they use for the replacement for the GSII) is based on A15 architecture which is proving to be the most efficient and fastest architecture out there. 2. LTE: While LTE use to mean a battery drain, last year companies like Broadcom have introduced LTE SoC which means that no longer is it a separate chipset on the device that caused most of the inefficiency with it. 3. Super thin: Okay, now this just ignores basic math. We all know to find the volume of a rectangular device you multiply length x width x height (or depth). So while the device may be really thin (rumored to be about 7mm), it still has a larger height and width which gives it a lot of volume for a larger battery to be in it. We have seen devices like the Droid Razr fit larger batteries in thin profiles. Also considering the fact that the hardware components (the camera sensor, the processor, and any other chips on it) on these devices are becoming smaller and smaller, that leaves more and more room for a battery. 4. Samsung: I don't know what the whole hate is with Samsung considering they are the go-to manufacturer for Apple. Taking that into account, they have to be pretty darn good at what they do. you are retarded as f**k. the more cores a phone has, or the smaller the die is the better it is on the battery because the CPU will not heat up as fast. looks like the SGSII.. but i doubt thats the new one.. and most likely it will still be as plasticky and the rest of samsungs.. Yet more powerful than any other smartphones! and this makes you mad obviously. in real life, they make no or a tad at best difference. aYou're right, s3 might have a faster cpu+ LTE + super thin. But in terms of battery, i think samsung might have done big changes in battery life. Maybe you haven' t read an article that samsung is doing some tweaks to improve its battery life and might be found in galaxy s3 as its one of its major features. This look sooo weird, i hope this isn't Galaxy 3. It's fake because TouchWiz for ICS looks just the same as TouchWiz for GB (well done Sammy) and so those blue status bar icons are wrong. well they do make the iphone and what would you say if this is the "SGSIII" dont speak about a company that you have no business you dont know crap about their future releases. and for your information look at the Galaxy Tab 2. is crap and worse the the 1st one. but of course you have no comment on that. that is a cheezy fan render. It looks like a note with ICS overlays.